The whiskers adorning its face generate electricity, which it can use to unleash a devastating electromagnetic orb, or project through its teeth to shock an opponent with its bite. It is primarily herbivorous, grazing on leaves, fruits and nuts in the treetops, but its wrath in battle is terrifying to behold. 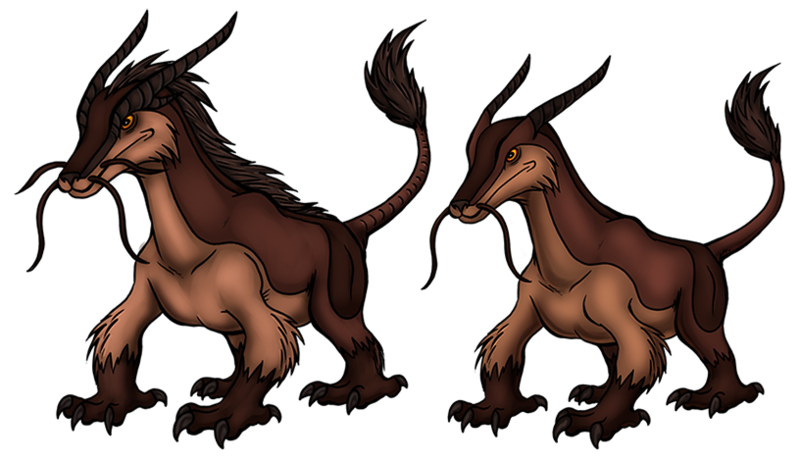 This Kreature is sexually dimorphic: the male can be distinguished from the female by his larger size, his quartet of whiskers, his pronged horns and his mane. Once a pair have bonded, they mate for life.